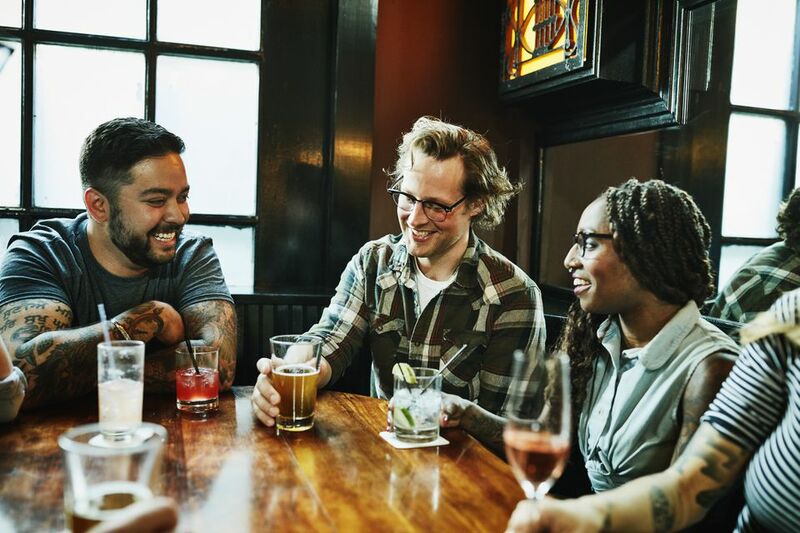 Whether you’ve had a long day, a particularly hard day, or you just feel like saving a few bucks where your booze budget is concerned, there are plenty of happy hour specials and weekly drink deals available all across the city of Toronto. With that in mind, here are nine of the best happy hour and weekly drink deals at Toronto bars found in just about any neighborhood. What’s even better than happy hour in the city? That would be Magic Hour, a term coined by Luma for their daily drink specials. Head up the stairs, grab a spot close to the windows where you can gaze out over King Street and order a gin or vodka martini. You can also opt for a Manhattan with a choice of Canadian Club, Forty Creek, or Jim Beam. Your other option is bottles of Grolsch lager. If you're hungry, pair your boozy beverage with a selection of snacks and appetizers. Cozy Bloordale bar and restaurant Bar Neon is a neighborhood favorite for its great good, ultra-friendly service, and laid-back vibes. Add to that their daily happy hour special and you have a recipe for a place that’s always buzzing. During its happy hour, the bar offers discounted oysters and pints, both of which are perfect to enjoy once you cap off a work day. Located on King Street, Earls Kitchen + Bar is very popular with the after-work crowd thanks to its generous happy hour deals and daily drink specials. Each day you can get a variety of drink deals, which vary by day of the week, as well as well-priced snacks to pair with your beverages. Over at seafood spot Pearl Diver, you can take advantage of their daily Zinc and Drink deal, which includes a dozen oysters and drink deals from Beau’s Brewery and Tawse Winery. If you happen to be visiting later in the evening, a dozen oysters are available for a discount and paired with drink deals from Wellington Brewery. Charming Northwood is a great spot to go for inspired cocktails as well as craft beer and coffee. But if its happy hour deals you’re after, it also delivers as it offers ​a discount on a rotating list of craft beer. There are numerous Firkin pubs spread out all over the city so no matter what neighborhood you live in, there’s bound to be a Firkin nearby. Better yet, they all offer weekly deals where food and drink are concerned. Their Bevvy & Bites menu pairs a different dish with a different drink each day in a move meant to fill you up without being too hard on your wallet. Not many people can argue with the fact that Sundays can be tough when thoughts of starting the work week start to creep in. The Junction’s Farmhouse Tavern aims to help you extend the weekend a little longer with its F*ck Mondays specials that happen every Sunday at various times. It also offers discounted oysters and half-priced food at selected times. Head to this friendly pub around Dupont and Spadina for its daily food and drink specials that vary by day of the week. The Pour House Pub & Kitchen features two dozen craft beers on tap with another 20 available in bottles as well as hand-crafted cocktails, wine, and hard liquor. Anyone who finds themselves in the Annex on most days of the week can stop by Insomnia Restaurant and Lounge for some decent happy hour deals and drink specials. Among its discounts include mimosas and martinis, half-price wine, and a late-night menu.